In 1922, Brunei joined the Straits Settlements states exhibiting its products in the Borneo-Malaya Expo which was held in Singapore. It is not known whether Brunei actually exhibit its products and who actually went to the expo. 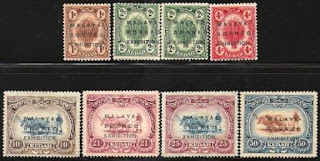 But what is known is that during the expo, all the Malaya states plus Singapore, North Borneo (present day Sabah), Sarawak and Brunei all produced overprinted stamps - stamps with the words Malaya Borneo Exhibition. In Brunei's case, it was Malaya Borneo Exhibition 1922. Most of the other states just overprinted with the words 'Malaya Borneo Exhibition'. These stamps were not in the earlier form accepted as new stamps as they are old stamps with the overprints. But over time, these have been accepted as a special print and are now recognised. I have been trying to collect the other staes ever since I completed the Brunei set a few months earlier. The other day I was able to buy additional stamps for the Kedah set. I am only short of the $1 stamp for the Kedah state. If you happen to have that particular stamp, please let me know. For those who have been keeping up with what I do would know that I was away in Tehran for a few days. What did I get there? Plenty of knowledge especially numismatically. 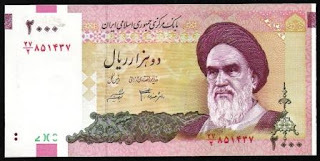 The Iranians still keep their old currencies, coins and stamps. I was able to get what I thought was the entire set of the Shah Reza Pahlavi, the former King who lost the throne to the Islamic revolution in Iran. But when I checked back, there was a couple of notes missing. The price was pretty reasonable. The note I am showing here is not that of the old one. In fact this is the current 2,000 riyals worth around US$0.30. I found it amazing that the note shows the Kaabah. 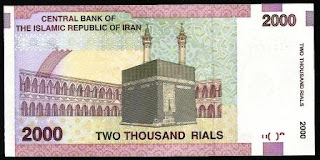 Even the Saudis, it was only recently that the Kaabah appeared on their notes. When I was in Singapore, I found this note and several versions of it including the million dollar. These sold for $2 each. I am not sure of the legality of selling these notes or even buying them. US Dollars are currently printed denominations are $1, $2, $5, $10, $20, $50, and $100. Notes above the $100 denomination ceased being printed in 1946 and were officially withdrawn from circulation in 1969. These notes were used primarily in inter-bank transactions or by organized crime; it was the latter usage that prompted President Richard Nixon to issue an executive order in 1969 halting their use. With the advent of electronic banking, they became less necessary. Notes in denominations of $500, $1,000, $5,000, $10,000, and $100,000 were all produced at one time but never the $1,000,000 or the $1,000,000,000 which is reproduced above. In 2003, ASEAN countries and Japan had an ASEAN-Japan Exchange stamp issue to commemorate the ASEAN-Japan Cooperation. 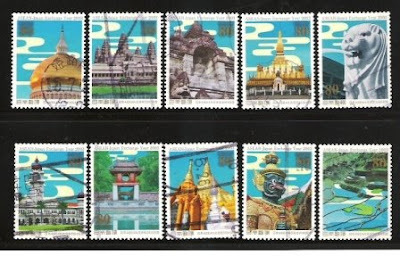 Each ASEAN country was supposed to come up with their own stamp designs. Japan did a whole set on their own where they depicted one particular scene of each country. If you look at the stamp for Brunei, you would see the dome of SOAS Mosque. This probably marked the first time that the SOAS mosque appearing in another country's stamps. I don't think there has been another ocassion for that. During my trip to Singapore a couple of weeks ago, I went round the philatelic shops there. I did not have anything specific but I just wanted to see if there are any gems that other people have overlooked or something which I have not bought before. I came across a few stamp collections of the Malaya Borneo Exhibition. The Malaya Borneo Exhibition of 1922 was when the Straits Settlement Government in Singapore decided to have a big expo with products from the Federated Malay States, the Unfederated Malay States pus a different sort of federation like Brunei. Anyway, all the states produced 'new' stamps which are their existing stamps and overprinted that with the words 'Malaya Borneo Expo'. I have the complete Brunei set and now I am slowly builing up on the other states as well. This one is the 'cents' values of the Kelantan set.